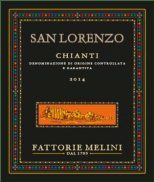 Terroir: The vineyards that produce Fattorie Melini Chianti San Lorenzo sit on the grounds of Melini’s primary cellars, an area traditionally acclaimed for their fortunate combinations of soil, aspect and climate. The complete property is over 400 acres, of which 150 are vineyards. The vineyards sit on the hillsides surrounding the property with elevations reaching 1,000 feet. Soils vary across the property with a combination of Galestro (a loose, marl-like schist soil), albarese (weathered sandstone from sedimentary, compact limestone rocks), and clay. Vinification: Harvest begins in early October as the Sangiovese grapes achieve optimum ripeness. Following the crush, there are 3-4 days of cold pre-fermentation maceration at a controlled temperature (79-82.5 degrees F) with frequent remontage (pumping over). The aging process is short, (4 to 5 months) and occurs in new and old and a small part in barriques. This fresh, clean and overall delightful wine has a bright ruby color and characteristic bouquet of red-berry fruit and violets with a faint note of almond on the finish. An unrivaled introduction to Tuscany and Italian wines. With a bright, ruby color, the wine has a pronounced bouquet of raspberries and blackberries, with hints of violets and irises. In the mouth, there are well defined, full and savory flavors with a lingering, pleasant aftertaste of wild forest berries, blackberry preserve and almonds.